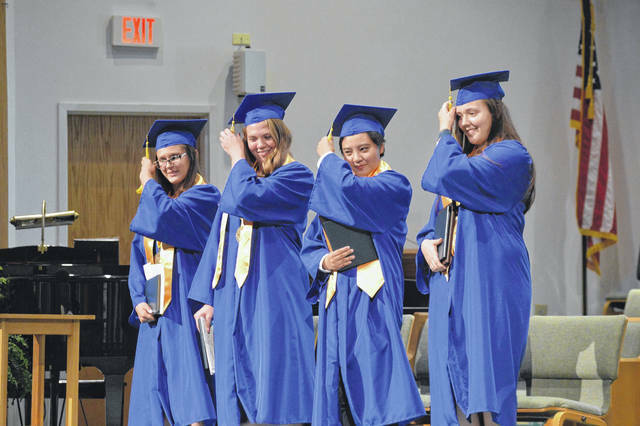 Shelby Bing, Cori Hutchison, Yu Yan Sun and Katie Westfall move their tassels as a signal of their graduation from Ohio Valley Christian School on Saturday. GALLIPOLIS — As the only four ladies in their class, Shelby Bing, Cori Hutchison, Yuyan Sun and Katie Westfall were the stars of Saturday’s Ohio Valley Christian School graduation commencement as friends, family and teachers celebrated their steps into the next chapter of their lives. Pastor Aaron Young led the invocation and OVCS science teacher, Harold Taylor, served as the day’s keynote speaker. Taylor shared jokes and small pieces of advice with his students, as well as some personal memories. Valedictorian Bing, graduating with a 4.0 GPA, spoke before the assembled next. Salutatorian Hutchison spoke next, graduating with a 3.98 GPA. Stephen Jenkins, of the OVCS Governing Board, presented students with their diplomas. School Administrator Patrick O’Donnell presented students with awards and wished them well on their next steps into college. According to O’Donnell as he presented the graduates, Shelby Alaine Bing has attended Northbend Church for nine years. She has been a student of OVCS since the ninth grade. She is a member of Christian Honor Society. She has gone on two mission trips to New Orleans and has been involved with 4-H, student council and yearbook. She is the recipient of the Holzer Science Award. She will be attending Mount Vernon Nazarene University, where she has received the Founders Scholarship, Honors Program Scholarship and the Presidential Academic Scholarship, to major in English. Cori Hutchison has attended Ohio Valley Christian School since eighth grade. She attends River of Life United Methodist Church. She is a member of the Christian Honor Society. She has been involved in Student Council, Choir, Yearbook, and sports such as cheerleading, volleyball, and basketball. She plans to attend Mount Vernon Nazarene University, where she has received the Heritage Scholarship and Music Scholarship, to major in business administration with a worship ministry minor. Yuyan Sun has attended Ohio Valley Christian School since sixth grade. She has been involved in the varsity basketball team, yearbook and band. She has earned the President’s Outstanding Academic Achievement Award. She is a member of the Christian Honor Society. She plans to attend Ohio State University to major in international business. Katie Michelle Westfall has attended OVCS since kindergarten, with the exclusion of sixth grade. She has been involved in band, choir, basketball and volleyball. She is a member of the Christian Honor Society and the recipient of the John Philips Sousa Award. She plans to attend Marshall University in the fall where she will be majoring in athletic training.